SCVHistory.com | Pico Canyon | Description of 1893 Pico Canyon Earthquake. Detail of map included with original publication. Click to enlarge. 1893. April 4; Mojave. At 11:40 a.m. to-day this place was visited by four distinct shocks of earthquake. Buildings were rocked for several seconds, creating considerable fright (VII?). At Saugus, 70 miles south, chimneys were knocked down and dishes and other household furnishings were broken (VIII?). The impression is that the shock came from the northeast. 1893. April 4; Los Angeles. At 11:48 this morning there was a slight earthquake of short duration. The movement was from west to east. In Observer Franklin's office the barometers were well shaken, and continued to oscillate perceptibly for two minutes at least. It lasted about eighteen seconds (III?). Earthquake measurement scaled used by the author; corresponds to magnitude in the text. Click to enlarge. 1893. April 8; Los Angeles. Alarming reports of seismic disturbances have just been received from the oil region of Newhall, 35 miles from this city. Dating from last Tuesday, the day on which Los Angeles experienced a slight shake, there has been a terrifying series of temblors, accompanied by subterranean explosions. These disturbances have been frequent, and have been accompanied by landslides from the mountains of an alarming and dangerous description. A letter dated from Pico Canyon, about 8 miles southwest from Newhall, reads substantially as follows (and refers to the shock of Tuesday, April 4). "I was driving this morning when my horse became frightened without apparent cause, and there came a rumbling sound which grew terrifying. I looked up and saw an awful sight. Landslides from every peak in sight came tumbling down with huge bowlders [sic]. The mountains appeared as if myriads of volcanoes had burst forth. When I got to the long bridge I saw Mr. Thomas standing dazed, holding to the railing, and others came running across the bridge. The earth opened up in a number of places and the scene was indescribable. Men cried, prayed and swore. When I reached my house I found everything upset. Pictures, dishes, and everything breakable were smashed, and two stoves were broken all to pieces. All the afternoon lighter shocks continued, and also through the night" (VII). "On Wednesday night, just as I had gone to bed, 'Crash!' came another great shock. All night long they recurred, keeping us up until morning; and all day Thursday they continued, each preceded by a heavy subterranean explosion. The house the foreman lived in was demolished this time. Last night was less exciting, and at 3 o'clock this (Friday) morning we had another, which was fully as terrifying as the first. The shocks were worse in the canyon here than elsewhere, but at Newhall and all around this part of the county they have been terrifying" (VII, VIII). The excerpt of the narrative that is presented here. Click to enlarge. 1893. April 9; Los Angeles. The San Fernando range of mountains, where the greater disturbance took place during the week, were pretty generally shaken up every day, beginning with Tuesday. The last temblor, a slight one, was felt in the canyon about 10 o'clock Sunday night. There were no shocks so severe as the first one, and they gradually lessened in force and frequency. 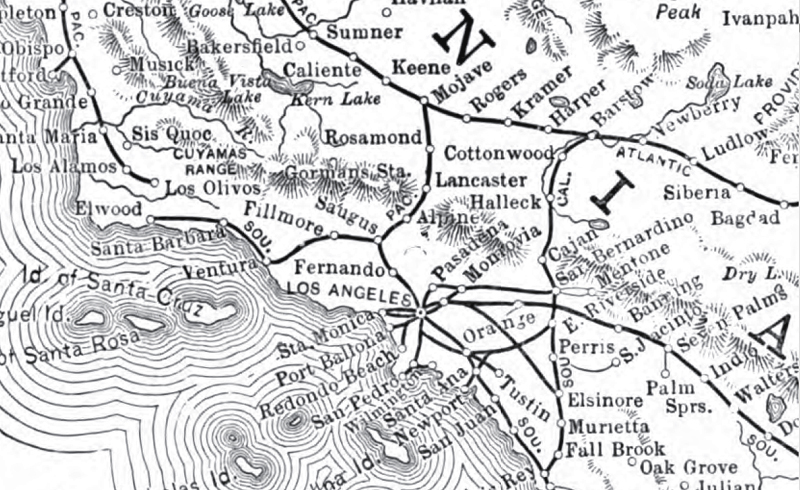 As far as can be learned the area of the temblors was not confined entirely to the San Fernando range, but dipped across the big Newhall ranch, past Saugus and over into Castac [sic] and Piru mountains, north of Newhall. Strange as it may seem, although Newhall is only 8 miles from the Pico Canyon, where the shakes were more continuous than elsewhere, the people in that town did not feel many of them. The greatest disturbance was in and around the oil wells of the Pacific coast and San Francisco companies at the head of Pico Canyon. Mintryville [sic] is a little town with a schoolhouse, and is the residence of the superintendent of the oil companies. Scattered about are pretty little cottages, the homes of employés. One who has not visited the peculiarly formed canyon can hardly have a clear conception of the consternation with which the earthquakes were received by the 130 people who live in this vicinity. Temblors that would, as these did, tilt up great oil tanks full of oil, detach immense bowlders from the mountain sides weighing tons, and cause big surface fissures in the ground in various places, are not calculated to make people rest well at night, and when these disturbances continue at irregular intervals for five days it is a wonder that the women and children in the canyon bore the ordeal as bravely as they did. "It was a few minutes after 12 o'clock. The men had nearly all left the derricks. Suddenly there was a peculiar swaying of the ground and an explosion which I can hardly describe. It was heavier than any blast I ever heard. I was on horseback, and the horse was frightened very badly. At first I thought of a boiler, but looking along the San Fernando range, as far as I could see east and west, there was a blinding cloud of dust. It rose directly up from the top of the range and was thick. All around me the dust rose from the hills in the near vicinity and earth and bowlders came tumbling down. The shock lasted between ten and fifteen seconds. I looked across the valley and saw the same thing in the Castac Hills. That shock was the worst and it was accompanied by a rumbling sound. The shocks since that time have been smaller ones. They have not affected the flow of oil. There was not the slightest disturbance in any of the wells. I have been here for nineteen years as superintendent of the oil wells, and this is the first time there has been an earthquake in this vicinity." At the head fo the canyon and at Mintryville, which is nearly 2 miles below, the first shock played havoc with the crockery in nearly all the houses in both places, and a lot of milk pans full of milk, a quantity of eggs, and the stove and nearly every loose article in one house were thrown in a jumble on the floor and mixed up with the ashes (VII). The schoolhouse had a large brick chimney, and after the shake there was not a whole brick left (VII?). An immense stone came tumbling down a mountain side and landed in among the pipe lines and tanks below, smashing things generally. Strange to say, not one of the many huge derricks, which are from 40 to 70 feet in height, was overturned, although they swayed in an alarming manner (VII). The motion in all the shocks was a swaying motion, and the direction was from northwest to southeast. An old and strong adobe house on what is known as the middle Newhall ranch, northwest of Newhall, was shaken completely down by one of the temblors (VIII).